Here at Hillside Walks in West Cork we will guide you on a West Cork hill-walking holiday along Ireland’s beautiful Atlantic coastline. The Sheep’s Head Way walking route is renowned as one of the most spectacular walking routes in Europe. It brings along the coastline of the Sheep’s Head peninsula with Bantry Bay and Dunmanus Bay below you as you hike. Take a guided walk along the Sheep’s Head Way with Hillside Walks and you’ll find out about the rich history of the Sheep’s Head peninsula as you explore a landscape marked with the traces of Ireland’s rich history. Take in the rugged beauty, and the fine views across the neighbouring West Cork peninsulas and islands. This unspoilt part of Ireland has been recognised as a European Destination of Excellence in recognition of its outstanding natural beauty. Our tours with experienced walking guide Charlie McCarthy can also be arranged to include accommodation at Seamount Farm B&B. Scenically set with interesting gardens, Seamount Farm B&B is a restored 7th-generation Irish farmhouse with traditional stone farm buildings. It’s the ideal base for a hill walking holiday in Ireland. 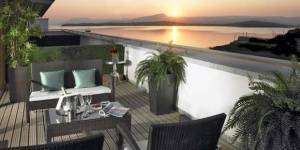 The house boasts magnificent views overlooking Bantry Bay and across to the Beara peninsula. If you would like to stay in different B&Bs during your visit, we can save you the worry of sourcing accommodation and arrange this for you. Guided walks can be arranged for all visitors to West Cork. Further information: All walks are priced individually and we offer discounts for groups - please ask us when making your booking. We operate throughout the year subject to weather conditions and availability. 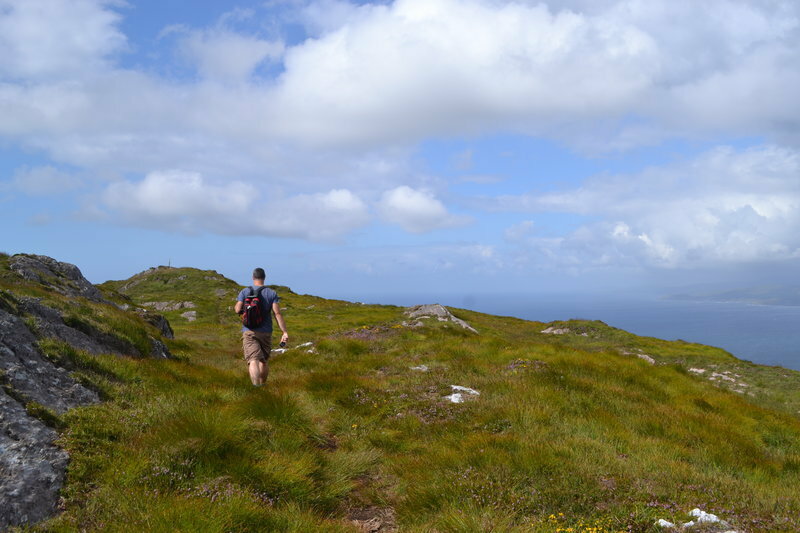 The route climbs up to the ridge of the peninsula, and rewards you as you walk with views over Kilcrohane, our West Cork bays, the Mizen and Beara peninsulas and the West Cork islands in Bantry and Roaringwater bays. The chance to reward yourself with a fine feast, or a drink overlooking Kitchen Cove at Ahakista‘s Arundel’s By the Pier isn’t to be missed at the end of your journey. From the car park at Arundel’s by the Pier, take a right onto the public road and continue on until you arrive at a tee junction (Ahakista Bridge). Take a right here and then the first left as per the finger post sign and follow the blue arrows for Seefin. At the next finger post sign keep left and follow the blue arrows for Seefin in a northwesterly direction and at way marker no. 9 (Seefin) continue straight on along the track. When you arrive at way marker no. 10 for Seefin take a left and follow the blue arrows in a southwesterly direction until you reach way marker no. 21 for Seefin. Take a right here and continue on in a northerly direction. At The Windy Gap Junction sign (way marker no. 165) take the Seefin/Kilcrohane option keeping left in a southwesterly direction for the summit of Seefin. When you reach the top take a sharp left at the Trig Point/way marker no. 41. Descend following the blue arrows and continue through to a farmyard. At way marker no. 64 you will go off road and then pass an old “Cillín” (little church or burial ground) and a fort on your way. At way marker no. 76 continue on down until you reach way marker no. 92 on the old Kilcrohane/Ahakista road. Take a left here and continue straight on along the old road. You will eventually arrive onto a tarred road, passing by the Átha Thomáis memorial em route to the main public road. This will lead you back to Ahakista bridge and the car park at Arundel’s by the Pier.